Our volunteers will be there to direct you where to go for each session. American (while) Muslim can mean a lot of things. In this session, our speaker will give a high-level overview as to what type of issues our community faces on a day-to-day basis. The onslaught of the Islamophobia industry, issues with law-enforcement, and the struggle to gain a voice in the present-day political discussion are some of the issues we will touch on in this session. This groundbreaking book has uncovered key tactics that have been employed by the FBI under the guise of the “war on terror.” Trevor’s expose uncovers how the use of informants, agent-provocateurs, and manufactured plots have become commonplace tactics in the national security enterprise. Islamophobia has become a well-entrenched, highly funded phenomenon in the U.S. In states like Tennessee and Florida, this has evolved from just hateful rhetoric into a swath of mosque oppositions, anti-Sharia legislation, court battles and issues with elected officials. These speakers will touch on the issues they have faced in their communities, and how they were able to face down this negativity and turn it into a an opportunity for community building and positivity. As we turn on the TV, browse through the internet or flip on talk-radio – all types of so-called experts are banking off an industry that attempts to define Islam and Muslims. But how do we – as a community take control of that narrative in definining our own identity? This panel will dive into these issues in what promises to be an informative an provocative session. Our esteemed panelists bring a diverse background and perspective to give their insights on how to empower our next generation of leaders. How do we channel the immense talent of our community toward creating new leaders and activists for the future? This discussion will give us some great insight. MLK once said: “Injustice anywhere is a threat to justice everywhere.” In a time when we see oppression and injustice around us, many are left feeling helpless and ineffective. Some say that “this will pass in time” while standing by and doing nothing. This session will discuss why it is in our traditions to stand up – Islamically and from an American activist perspective as well. 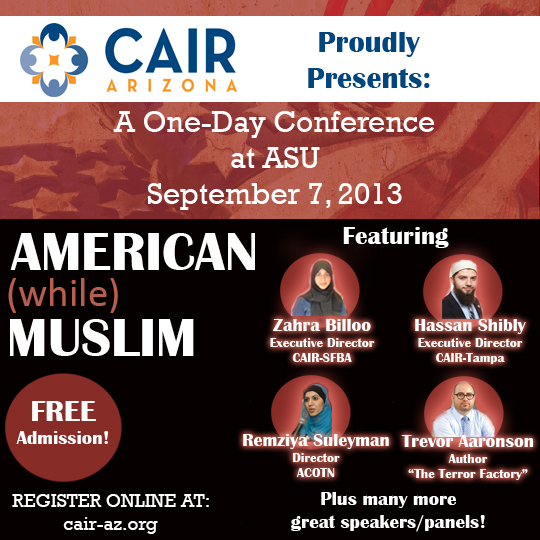 In the conference, we’ve discussed the problems that the American Muslim community faces – but where do the solutions lie? One of the solutions is to engage with your elected officials and to maintain an effective dialog with their offices. Another key solution is the importance of building strong allies from within the community. People who will stand side by side with you when your issues come up – and vice versa. Our speakers will highlight these areas and uncover how these strategies have led to key victories in their community building experiences. As the conference comes to a close, we cap off the day discussing what it will mean to be “American (while) Muslim” into the future. Our panelists will give their expert insights to give us perspective on what we can build toward in the future.